The Merriam’s turkey (Meleagris gallopavo merriami) is native to the ponderosa pine forests of Arizona, New Mexico, Colorado, and the rest of the Rocky Mountain range, and has been transplanted to Nebraska, Montana, Washington, California, Oregon, and the Canadian provinces of Alberta and Manitoba. During the summers, the Merriam’s turkeys can be found in open grassland areas; while they prefer more protected wooded areas during the winter. 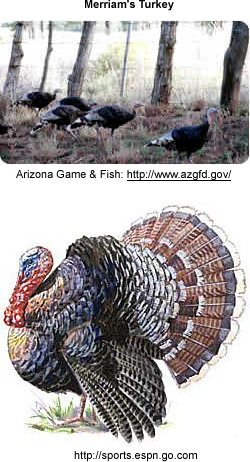 The Merriam’s turkey eat a wide variety of nuts, seeds, fruits, tubers, flower heads, green leaves, and insects. Fruits and berries in the turkey’s diet vary from year to year depending on their availability. Cultivated grain, such as oats, barley, and wheat, are eaten when available, especially during winter. Frequently, the better turkey populations occur in the vicinity of grain fields. When available, the seeds of ponderosa pine are a preferred food. Snowberry, bearberry, hawthorn, serviceberry, chokecherry, and rose hips are eagerly taken by turkeys as are grasshoppers and spiders. A number of turkey populations subsist through the winter on grain provided by landowners. The mature Merriam wild turkey weighs from 14 to over 22 pound (6.4-10 kg), and its length, bill to tail, is 48"-50" (122-127 cm). Their wing span averages 50"-56" (127-142 cm). Its size is comparable to the eastern turkey, but has a blacker appearance with blue, purple and bronze reflections. The Merriam's appears to have a white rump due to its pinkish, buff or whitish tail coverts and tips. These tail feather tips are very conspicuous when the strutting gobbler appears against a dark background. The males exhibit black-tipped breast feathers, while the females (hens) have buff-tipped breast feathers. The white areas on her wings are more extensive giving a whiter appearance to the folded wing.